Proactive erosion control can reduce the load on sediment control and pairing erosion and sediment control is a wise way to design stormwater management plans. In our previous post we defined erosion, and shared some principles for effective erosion control. We noted that proactive erosion control can reduce the load on sediment control and pairing erosion and sediment control is a wise way to design stormwater management plans. To continue the discussion, we’ll highlight some common erosion control methods used at construction sites, including a few ideas for evaluating the quality of their installation and effectiveness. Rather than describe each of these in detail, we’ll focus on the common ground (sorry for the pun) and identify factors that apply to most of these control measures (Best Management Practices). The first key is to have consistent coverage with enough material to absorb raindrop impacts and to eliminate bare spots or thin cover. Where straw is blown over the soil and crimped into the soil it is common for the coverage to vary due to the nature of the application. Given that some variation is expected, the thing to look for is that the thinner areas at least meet the minimum expectations. 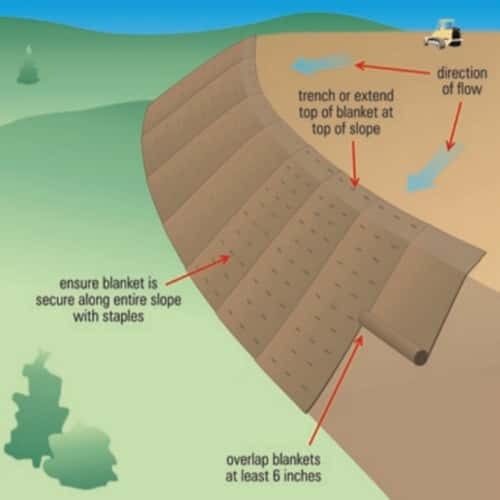 In the case of erosion control blanket, they key is to avoid gaps where the blankets meet. To help avoid gaps, most erosion control blanket manufacturers recommend a 6-inch overlap at seams. Hydromulching is another control measure where consistent application will improve effectiveness. The mulch material should be thick enough to absorb raindrop impact and consistent enough that all disturbed areas are properly treated. A second key to effective erosion control is to have good ground contact so that sheet flow cannot develop under the control measure. 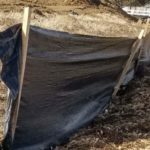 With erosion control blankets specifically, and because they are often installed on slopes or channels, it is important to have the edges or the top of slope area keyed into the soil. This helps avoid shifting of the blanket, and also prevents surface flows from developing under it. 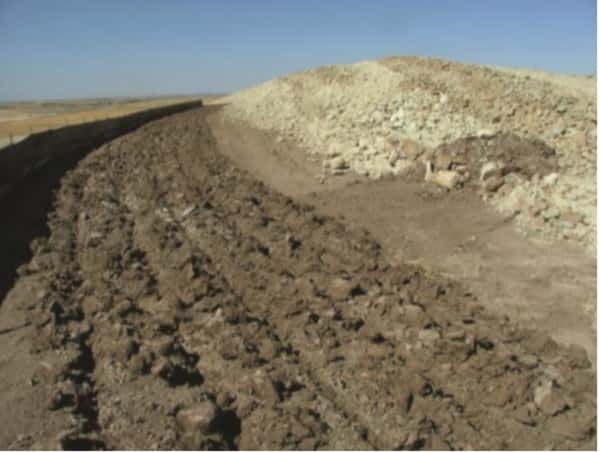 A third key is to install erosion control measures in a way that allows for infiltration of precipitation into the soil. Take for example the very basic, but very effective use of surface roughening. By removing compaction and loosening soil, more surface water will initially be absorbed rather than moving down gradient and causing erosion on its way. Note in the picture below that the ripping that was done to roughen the surface is on the contour so surface flows are interrupted. The result is that water flowing from upgradient that encounters effective surface roughening will be slowed down and this loss of velocity will reduce its erosive potential. So even something as simple as surface roughening works on multiple levels by both reducing the quantity of runoff and the speed of the runoff. 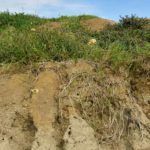 Before moving on from our discussion of surface roughening we should point out that when it is done as a standalone measure it is seen as a temporary application to provide minimal protection until other erosion control methods can be installed. 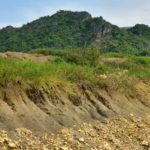 In those cases, it is also good preparation for the erosion control measures to follow, especially when the next method will involve seeding the area. The surface roughening and the associated infiltration of water will create better conditions for seed germination and root growth. One more reason to appreciate the lowly surface roughening method. So, the key takeaways for our clients and readers are the principles of taking action to prevent erosion by reducing raindrop impact and surface flow velocity. Using these ideas as a lens you can evaluate the effectiveness of an erosion control measure and the quality of the installation. By choosing wisely and ensuring that you are getting what you paid for, you can increase your stormwater program effectiveness and get the most bang for your buck.